Every few months, someone publishes another “Is Poetry Dead?” essay. I understand why—it’s easy click-bait, and there are certainly valid arguments to be made on both sides of the debate regarding aesthetic populism, outreach to new audiences, the accessibility of MFA programs and other weighty topics. The problem, however, is how the question is framed: poetry is dead because fewer people buy poetry books or read poetry journals, or poetry is dead because it’s stylistically stagnant, or poetry is dead because it doesn’t have a presence in the upper echelons of American media or culture. Left out of these equations, due to either simple ignorance or a willful distaste for the form (and its practitioners), is spoken word. Even the inevitable response essays and counterpoints that talk about how vibrant and important poetry still is almost always ignore spoken word. And spoken word is very much alive. Just about everywhere in the U.S. and beyond, colleges, high schools, community centers and after-school programs are using spoken word as a tool for both education and empowerment. Slam poets are going viral and racking up millions of YouTube views every day. Poetry slams and poetry-focused open mics are drawing larger and larger audiences. I, and a number of my peers, make a living as poets, whether or not we’ve been published. This movement is growing, and is only going to get bigger. 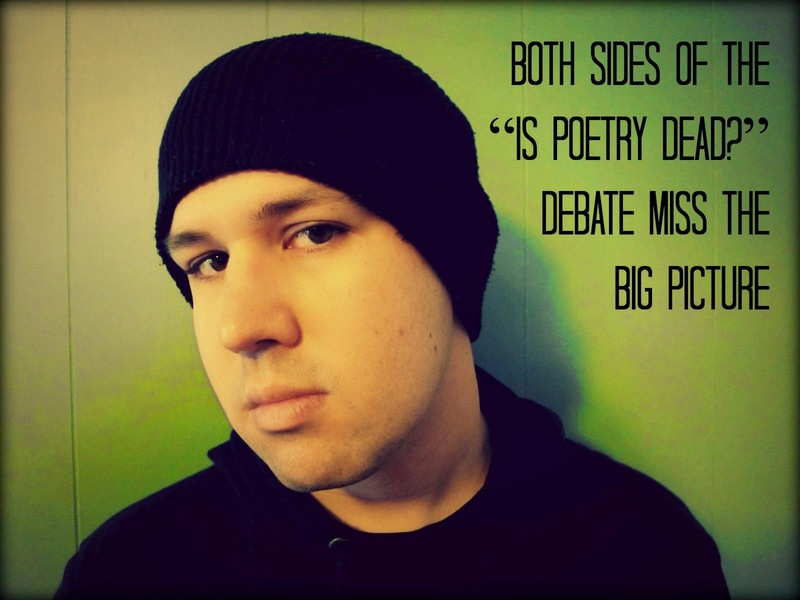 So why is spoken word ignored by those who claim to care so deeply about poetry? In some cases, it might be simple ignorance-- as popular as it has become, slam poetry could still be considered an "underground" movement, especially if your only engagement with poetry is through established, traditional channels. And to be sure, when people are exposed to spoken word, the odds are fairly good that they won't have immediate access to the best that the culture has to offer. To be frank, a lot of spoken word isn't great (which is true of any art, but magnified in spoken word because of its democratic nature; more on this later). Beyond that, though, I can't help but consider some of the ageist, racist and classist undertones to this exclusion. Spoken word is driven by young people, especially young people who hold any number of misrepresented or oppressed identities. It foregrounds political engagement and the power of poetry to make the invisible visible. It is not controlled or regulated by the gatekeepers and tastemakers who rule the worlds of publishing and academia. 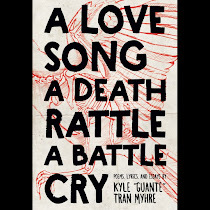 As much as it is a continuation or revitalization of poetry, it is also a radical disruption of the structures and cultures that have been dominant for a hundred years. That all might have something to do with it. In two days, I’ll be leaving for Brave New Voices, one of the biggest, most vibrant annual spoken word festivals in the world. I have the honor of coaching the team representing Minnesota this year. Out of respect for all the work they’ve been doing, I wanted to use this space to share a few thoughts on why I think spoken word is—and will continue to be—important. Maybe some people think poetry is dead because they’ve built their ivory tower so tall they can’t see us moving around down here. A fundamental pillar of spoken word is that it’s open. It’s democratic. Anyone can show up, sign up, and share something. You don’t need an MFA, or a co-sign from some authority, or X number of publishing credits to write, appreciate or critique poetry. Poetry is for everyone. Does that mean that you’ll often hear some stuff you don’t like at the local open mic? Of course. Hell, I dislike most spoken-word that I hear. But I can also see the bigger picture—at a given event (or online space like YouTube), you have the masters and the beginners, the innovators and the hacks, the elders and the youth, all right next to each other. Everyone learns from everyone. Everyone pushes everyone. Furthermore, when you open up the space for performers, you also open up the audience. Spoken word, nationally, is truly multicultural and multigenerational. This means that it’s also relevant; it’s connected to the community. There is incredible value in that. I’ve traveled all over the country as a performer, and everywhere I go, people are using spoken word to tell their stories. They’re talking about the issues that are important to them. They’re having in-depth conversations, networking and building movements. And whether the audience is in the dozens, hundreds or thousands, they’re doing all this publicly and loudly. There’s a stereotype that all spoken word is political. And while subject matter in the spoken word community is actually very diverse, there is an element of truth to that stereotype—a lot of spoken word does deal with social justice issues. The key, however, is in understanding why that is. Where else can a teenager get up in front of 300 people and talk about racial profiling (and be applauded wildly)? Where else can a survivor of domestic abuse do the healing work of sharing her story? Where else are we celebrating both the linguistic ingenuity and the change-making ability of young people? Where else are we getting large groups of people in the same room at the same time to appreciate language, share our stories and build community? These spaces matter; we’re witnessing an artistic movement, but also something that transcends that. Both of the first two points could be considered “extracurriculars.” What about the art itself? Isn’t spoken word all just style-over-substance, formulaic ranting and raving and pandering? To generalize like that is unfair and inaccurate. Page poetry can be engaging and exciting. And spoken word is so much bigger than that one crappy open mic you went to five years ago, or one cursory glance at the search results for "slam poetry" on YouTube. Even the page/stage divide is a false binary—an enormous overlap exists between published poets and performance poets, and we can all learn from each other. The takeaway here is that while there is a lot of not-so-great spoken word out there, the best stuff is some of the most breathtakingly dynamic and powerful art being made right now. Check out this list I've pulled together of 100+ poems (in video form) that I'd recommend. The best spoken word combines the rigorous word-craft of poetry with theater, music, dance, rhetoric, stand-up, storytelling and other arts, creating a hybrid form that is then presented directly to living, breathing audiences. The performative element doesn’t take away from the artistry—when it’s done right, it adds to it. And you don’t have to like it. We could go back and forth forever arguing about the art itself, but one thing that isn’t up for debate is the fact that spoken word has an audience. It’s a diverse audience. It skews young. It’s the future of poetry. And that’s scary for some people, but progress always is.